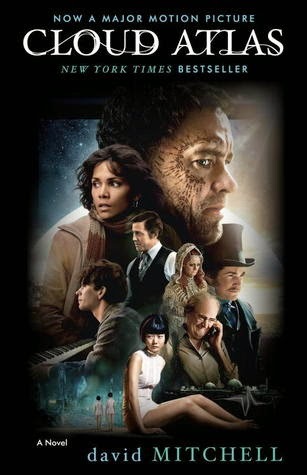 Cloud Atlas by David Mitchell is available at Amazon, Barnes and Noble, and BooksAMillion. Let me start out by stating that I received a free copy of this book from GoodReads First Reads in exchange for a review, which is great because I've heard a lot about David Mitchell and wanted exposure to his work. Mr. Mitchell's use of technique is mind-boggling. Cerebral, when you think of this story, and the ideas it encompasses, in an incarnation as an outline. Then, the book was written and that interlaced-technique gets weighted down by words filling in gaps on the outline. Six novellas, five of them broken in half to frame the sixth story, are laced together to depict (human) nature. Their connectedness is amazing, but the individual reading of each story was difficult because it all feels contrived. It also means that the story takes a long time to build because the reader has to reach the sixth story, 'Sloosha's Crossin' an' Ev'rythin' After,' to see the full world development (and from there it's all downhill, anti-climatic). That's a long time (pg. 239) to ask a reader to stay with a story to reach the hook. And, while we're on the topic of 'Sloosha's Crossin' and Ev'rythin' After,' I needed four days to get through this novella and it's one of the shortest in the book (tied with 'The Ghastly Ordeal of Timothy Cavendish' and 'The Pacific Journal of Adam Ewing' in page count). I read both halves of all the other novellas in two days (one day per half of a novella). It took me longer to read this individual novella because of the "evolved language" - hickinese is what I've been calling it. I could understand the language evolution we see in the other novellas because there's precedence for it (draught/draft) but the hickinese dialect was inconsistent. One minute, it sounds like beach-bum slang that lapses into Ebonics. The next, Appalachian Mountainese. The next, a four-year old kid. Sometimes, all of the slangs merged together in the same paragraph. Sometimes not. And everything is dotted with apostrophe's wicking my eyes off the page. It's as though the dumbest humans got stranded on one of the island-remains of Hawaii and this is what's left of language. Maybe that was the intent. But it was frustrating to read the entire chapter a'loud in the hopes of understanding the slang and there was a word (scavvers, scavving) that I'm still not sure what it means because it was used several times in several contexts. The individual novellas themselves are dull without the support of the novellas around it, which is fine since the novellas come together as a complete package. Each story tackles a different genre-style without being the best that the genre has to offer. None of the stories, on their own, hold up when pitted against the greats of those genres. Mostly because the author is constantly telling the reader what's happening instead of letting the reader figure it out. There were a couple times where it felt like a slap to my intelligence and it ruined the rest of the novella for me because I knew what to expect.